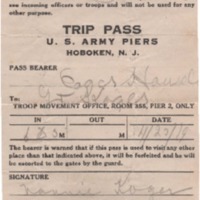 A trip pass for Nannie Koger, a relative of Thomas J. Koger, allowing her to visit him at the Troop Movement Office, Room 355, Pier 2, in Hoboken, NJ. THIS FORM OF PASS will be used for all persons desiring to see incoming officers or troops and will not be used for any other purpose. The bearer is warned that if this pass is used to visit any other place than that indicated above, it will be forfeited and he will be escorted to the gates by the guard. Shanks, David C. (David Carey), 1861-1940, “Trip Pass – US Army Piers, Hoboken, NJ,” 1919 November 19, T100086, Thomas J. Koger Collection, Woodrow Wilson Presidential Library & Museum, Staunton, Virginia.